Roblox has recently changed the way they handled the logins, so what you find in this guide is currently still usable but you have to change how you use the login function. Cookies are now required for the logins and you will need to get it yourself to work. We reccomend you no longer use roblox-js and just use noblox-js which has better support for the new login. This guide currently does not go over using noblox but it’s basically a maintained version of roblox-js. He currently has a written example of how to use his cookie login, you should go read it. If you continue on with this tutorial you can just install noblox.js instead of roblox-js and still follow along but keep in mind the changes. The cookie bypass may not work on Heroku, so I prefer you guys use something else if you don’t know how to setup a database with SQL or NoSQL (MongoDB). Before you begin reading this tutorial please know that it is unfinished and I only added as much as I did so far to get feedback on if I should build on it with things such as Google Spreadsheet and Twitter support. If this tutorial has a demand for it to be built on I will certainly post updates such as more commands and more framework scripting. If you have trouble with this tutorial or would like to learn more you can contact me on Discord (TechSpectrum#2620) and I’ll do what I can to help you or answer any questions. This tutorial is in no shape or form intended to be malicious to ROBLOX in any way. It is simply something for people interested in expanding their scripting abilities to look into. It will not include botting or anything as such for gaining an advantage on ROBLOX. It is only going to focus on the development side such as for clans to manage their members or for users to have a better discord experience with their community. Please visit the Discord.js server for additional support! 1. Start by creating a new folder, you can name this anything you want, we'll call ours "MyBot"
2. Access your Command Prompt, I use Cmder so I'll be accessing mine through here. 3. Type into your Commander Prompt "npm init" this is used to create our package.json fille we'll be using for all our dependencies such as Discord.js, Roblox-js, etc. Enter the name in lower case and you can just click through everything, when it's finished type yes and press enter. 4. 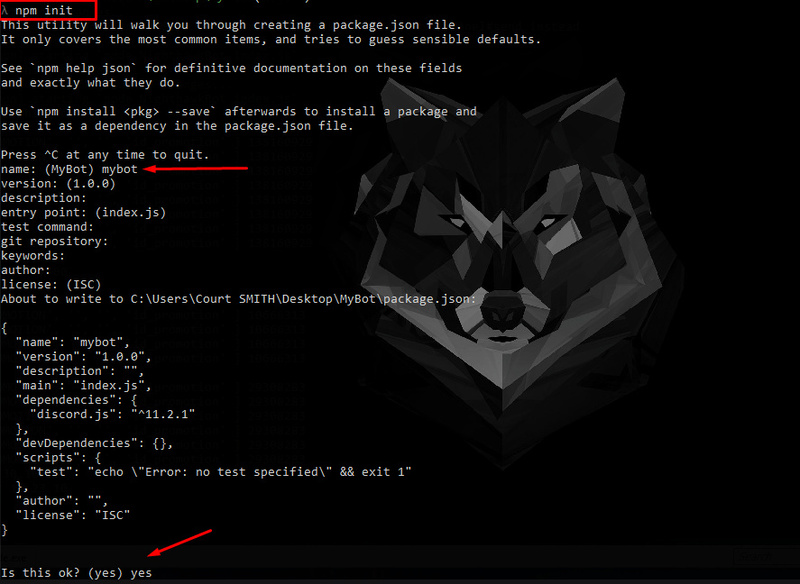 Type into your Command Prompt "npm install Discord.js " and you will then see your package is downloading and installing. ng and installing. " 5. 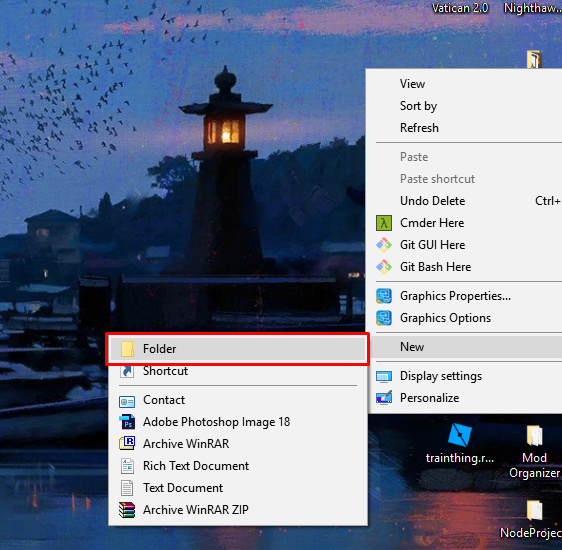 Your folder should now look like this, if it's not - make sure you completed the steps. 7. 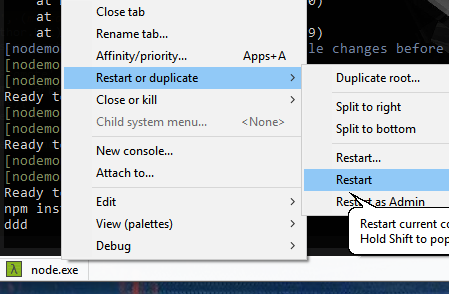 How to restart the Command Prompt/Program in Cmder - You will do this quite frequently when re-running your bot after making saved changes. This library is used to auto-restart your application once you click save. Some of my pictures have me typing in “node bot.js” and while you still can you just have to close and re-open or restart the command prompt to run the changes. Integrate your service with Discord — whether it's a bot or a game or your whatever you wildest imagination can come up with. This is your workstation for managing all your bots, you can create as many as you want (as far as I’m aware). 2. 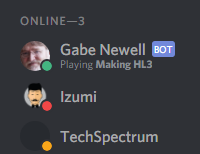 Give your bot a unique name, image, and description. Once that's that, hit the Submit button. 3. You'll now see you have a button to turn this account into a bot, click it and agree to change. 4. 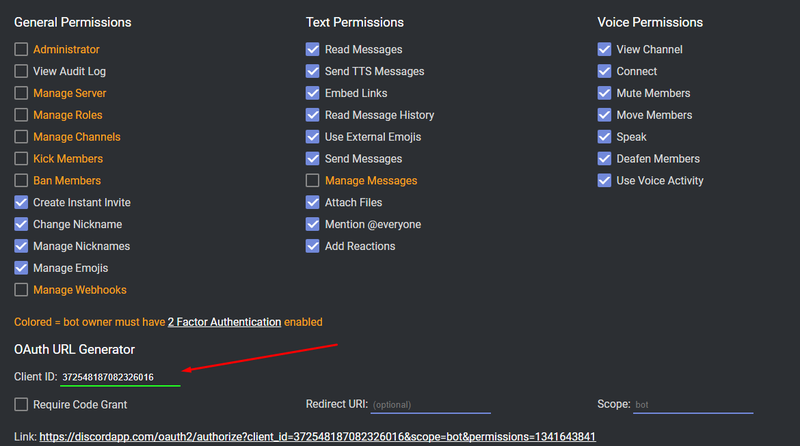 Go to the Discord Permissions Calculator listed at the top of this thread and enter your permissions. If you want all the permissions to become allows you must enable 2 Step Verification on your account. 5. 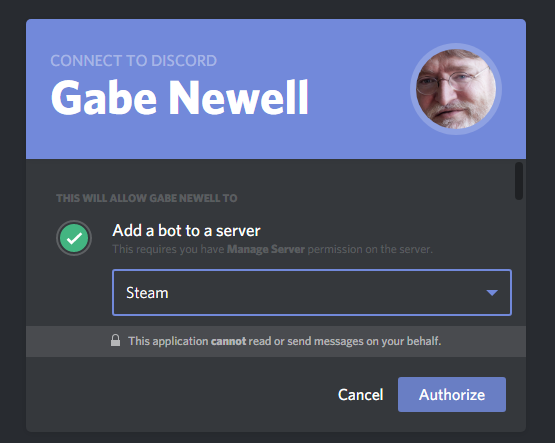 Select the server for your bot to be added to and continue with the Captca. This code here is all you need to login, just make sure you get your token off the web page you were on earlier to create the bot. Now if we save this to something like “Bot” the script file, we can head over to our command prompt and run the bot right now. So now that we now know how to bring our bot online we want to start figuring out how to start making it check for messages, when people join or leave our server, come online and more. I’m going to list out all of these below so you can see what we are going to go over. So lets go over what we just wrote for a second, you may want to refer to the Discord.js documentation’s class page for this. Once we login we then have the ready event that goes off once our bot is online. When this goes off you can tell it what you want it to do, and for us our client’s user as the method setGame which allows us to enter what we want. You can use this to display the server count, and it does not have to be fired within ready because this is a part of the client, so feel free to use the guildMemberAdd event to display the current servers size with client.guilds.size if you wanted to show off. Now you are probably wondering what a guild so if you haven’t figured it out already, it’s a server. Discord’s term for servers are guilds and all casses related to it can be found on the discord.js documentation page. Which brings us to guildMemberAdd where got member which is a property belonging to a guild. Remember that a member is not a user reference so you have to do that yourself and refer to your server just like the following code example. guildMemberRemove is the when the server member leaves but returns the same member object as well. Next we have message which is the most important part of our bot. A message is more than just context, it’s an object returning data such as author which is a drect “@” reference to the user, and content which is the true text of your message. We will be taking a message and breaking it down to create our first commands. if (message.author.bot) return; // Dont answer yourself. In this code I wrote the function isCommand to make it easier on you for checking for a command. It turns our command (“Ping”) and message content and turns it into lower case. This is so even if we say Ping or ping it would still work. Now in order to know if this was a command we added our own prefix which will be looked at the beginning of the message content for. Essentially this function is looking for “n!ping” to be the beginning of the message entered. Which will return true if it is. 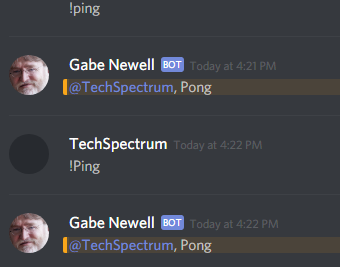 When it does return true we tell the bot to reply with “Pong” using message.reply which is a function that will result in the @ response as shown. Now sometimes you may have a command and the bot will reply to itself, we don’t want this so we added the message.author.bot check to make sure the bot will never reply to its own messages. 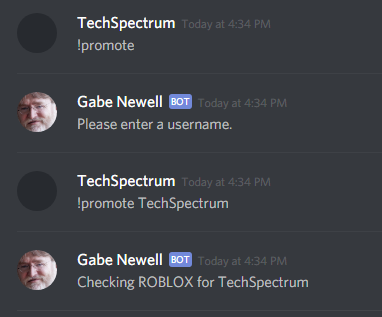 Last we are going to be working on a command to promote a user on ROBLOX but in order to do that we must first make a way to get a name to work with. So we have a args variable that is now an array. So what we did here was take our array args and just as I mentioned before took the index 1 for the first name we should expect to search for. Sometimes though someone may not enter the rest of the command and we will get an error. In order to prevent this we checked for username (args) if it existed, otherwise we will reply with a message asking them to enter the correct arguement. You may have noticed I said message.channel.send instead of message.reply and either you use it just fine. However message.channel will refer to the current channel the message is in, and channels have a send function we can use to post a new message with the @. Run this line into your command prompt after you restart the window, after a few seconds you should see it begin to download. 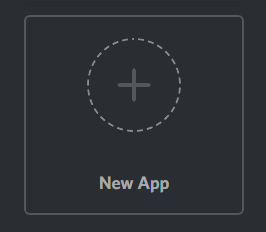 If you remember we did a require earlier for discord.js, you will put this line underneath it at the top so we can begin to use the library, you may find this familiar just like Lua Modules in ROBLOX. Now we need to login to a ROBLOX account, you should probably create something with a unique password that is not the same as your regular account. As you can see this is the main thing we have to do first before we can work with ROBLOX, just like Discord. However if you notice we have a catch and this is because a promise which is what Roblox-js relies heavily on to work. A promise the best way I can describe it is similar to pcall() which will return a result of success or error, this is great to avoid breaking your bot. Now lets head back over to our command. The documentation is pretty great so if you want to find out what a function does it tells you what you need to give it and what it returns. Now in order for us to first promote the username we gave we have to find it, you can use getIdFromUsername in order to return a users Id, and using the catch tell the user if this player doesn’t actually exist. From there we took the Id of the user and used getRankInGroup to find out what this user is in the group, if they are 0 they are a guest and if they are 255 they are the owner. We can promote a user by knowing this and setting a maximum promotion rank limit. Now that we got the Id and rank we made sure that we were not at the maximum promotable rank, and if we weren’t we could use promote which brings the user to the next rank in the group such as 23 to 24 or 14 to 17 if that is the next rank from the current one. Promote also returns to us an object called roles which contains 2 more objects, oldRole, and newRole that we then use to tell the server what we did. So this time around we want to be doing things like promotions on our games, perhaps things like commands. Thanks to sentanos we can do this with the server sided version of his roblox-js library which requires absolutely no hosting on your end. Be sure you extra everything from the ZIP files, we want to focus on 3 things. 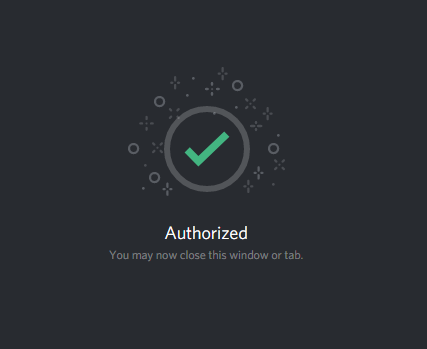 Just like your bot for Discord this also requires a ROBLOX accounts Username and Password to login, and now we 2 other settings to work with. Key is something we make up ourselves, such as “thisismysecretpassword” or “jKKlkis9929Nnxnwi” but write this down somewhere because you will need it for your ROBLOX Server script. The maximum rank setting is there to protect certain ranks from being changed such as your officers, so if your highest Low Rank or Medium rank is 15 and the next rank is an officer at 17 you want to want to make Maximum Rank 15. Once you do, you can go to the folder where you put your exported files from roblox-js server and enter your Command Prompt for that folder. It will ask you to type in your heroku account credentials, Email and Password. This is going to initialize our git depository to push. Once it’s finished we now need to push all our files since it’s empty. Give it time to add all your content it will let you know when it’s finished, depending on the speed of your computer this could take some time. Once everything is finished being pushed it should tell you that it ran successfully to verify there was no errors. And copy/paste the script inside of it into ROBLOX as a module. local domain = 'rbx-js.herokuapp.com' -- Make sure there is no http:// in here! Let me know what you think so far, I hope I explained myself well. Reply to Post "Group Games - Ability to modify rank/role through Lua API"
This is great for people who don’t really know how a lot of clan and discord bots work. I always love what you do, Tech! <3 Keep it coming. Woooooo, yeah! TechSpectrum, you da man! NodeJS is the only real dev language. I agree. I use it for GalacticBot and all my websites now. Really detailed tutorial, very nice stuff. I’m facepalming rn seeing some of those functions I didn’t use in my bot. Hahaha, man it made a world of difference, I don’t event think to much of using commando cause its easier this way. How to host a Bot for a ROBLOX Server! 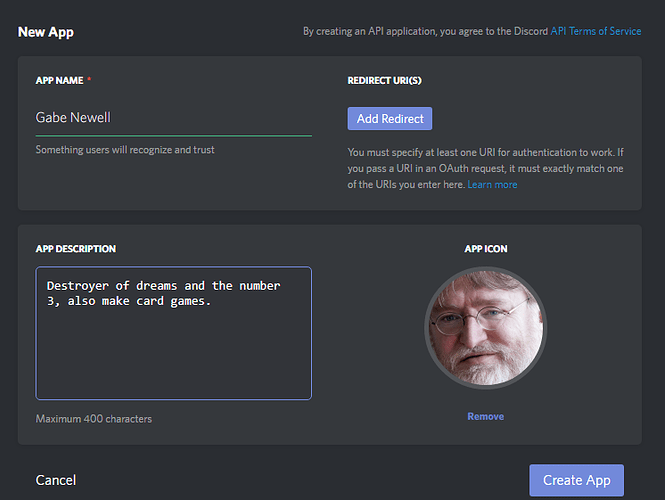 On a side note, there is also a library for coding Discord Bots with Lua called Discordia. Probably because I tried to authorize special permissions that required double authentication when I didn’t have it turned on. It will do that if you try. So that will be done with the new update? Near the end of January after this week once I finish my exam Ill post some updates. 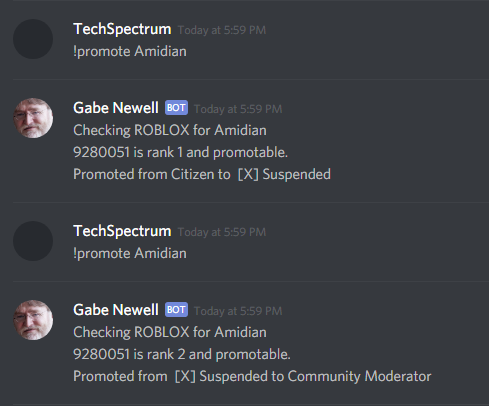 This is due to Roblox adding Captcha to a lot of APIs in order to prevent bots. Specifically for the message and join group APIs to my knowledge. Login APIs will also give captcha if too many people are logging in from one IP.